After Jacques Kallis had Daniel Vettori caught behind, South Africa seemed in a hurry to end the match as quickly as possible. Three balls later, they asked for a review on an lbw appeal that was turned down against Kruger van Wyk. The diminutive wicket-keeper was struck on his front pad, after getting a good stride in and looked, to the naked eye, to have been hit outside the line. The review confirmed that he was and although the ball would have gone on to clip off stump, the umpire's call stood. It appeared to be an act of desperation, though, as South Africa hoped to run through New Zealand and give themselves two days off. As lunch approached and South Africa looked for something to tease their appetites with, Mark Boucher decided he would take over. He walked over to Dale Steyn to offer some advice and kept going all the way to the fast-bowler's mark with him. On his walk back to his own position, Boucher ordered Hashim Amla, who was fielding at short leg to hand over his helmet and move to deep square, to wait for the pull shot, and rearranged the slips. Steyn's next delivery was a fiery bouncer but van Wyk didn't have to do much other than duck under it. Mark Gillespie proved himself to be an all or nothing man with the ball and he seems to be that way with the bat as well. He faced nine entertaining deliveries including one that he sent sailing for six with all the carefreeness of a balloon left to coast through the air. It was a good-length ball, Gillespie made room for himself and slogged over long-on. The boundaries are not particularly long so the big hit found itself well over and as a bonus, a member of the crowd caught it and won 200 New Zealand dollars for his efforts, the first time that has happened successfully in the match. Vernon Philander has become used to leading the pack off the field and he did it again at the end of New Zealand's second innings. With ball in hand Philander was first through the white picket fence and onto the paving where Gary Kirsten greeted him with a high five and Allan Donald with a pat on the back. South Africa let Dale Steyn walk in next and Morne Morkel after him as all the bowlers were allowed their moment of glory. At the back of the queue was a reluctant Imran Tahir, who bowled 17 overs without a wicket and must feel as though Test cricket isn't giving him what he hoped it would. Tahir hoped to slink in with the rest but AB de Villiers nudged him forward and clapped him in, a gesture of reassurance over his role in the side. New Zealand must have known they were out of luck when Gillespie appealed for lbw against Graeme Smith and was found to have overstepped on review. The ball appeared to have struck Smith in line and ball-tracking replays showed that it may have shaved leg stump. None of it mattered because Gillespie's foot was a good few centimetres over the line. 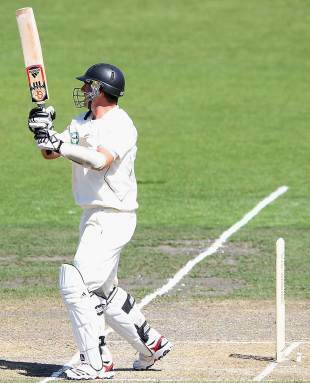 Doctrove also missed a no-ball in the first Test, off Doug Bracewell who appealed against Jacques Rudolph in the first innings in Dunedin. The only joy New Zealand got out of both of those was that they were given their reviews back.